Late last year, the folks at Namco Bandai unveiled Keroro RPG: Kishi to Musha to Densetsu no Kaizoku (Keroro RPG: Knight, Warrior and Legendary Pirate in English). Developed by the company's Tales Studio, this forthcoming DS title combines the Keroro (known as Sgt. Frog to English-speaking audiences) anime license with the Linear Motion Battle System of the Tales series. No, your eyes aren't deceiving you: One of the game's characters is calling on the support of Pac-Man and Blinky in the image above. A number of other Namco classics will be represented in the game, too. Among them: Dig Dug, Katamari Damacy, Klonoa, Taiko no Tatsujin and Xevious. 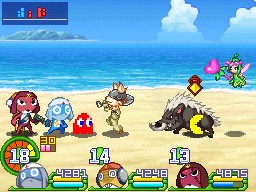 Normally I'd say there's no way Keroro RPG will be released outside of Japan (à la 2005's Namco x Capcom), but that's exactly what has happened to a number of Sgt. Frog manga volumes in the last few years so, who knows, maybe Namco Bandai will throw us a bone. Huh. You had me at Katamari Damacy! Why'd I have to go and sell my PSone?